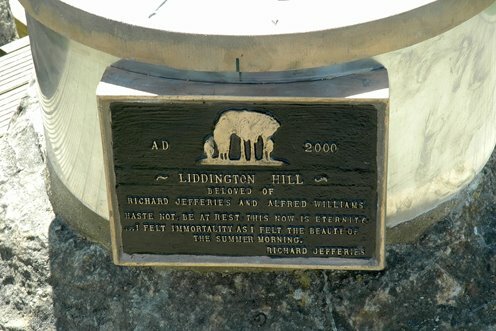 Liddington Plaque and Viewing Table. 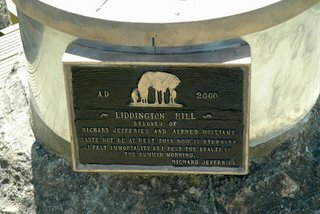 On June 24th around 50 people attended an event at Liddington Hill when a memorial plaque and direction marker was unveiled by Lord Joffe. The weather was perfect, the views superb and a skylark sang overhead to add to the atmosphere of the occasion. Lady Treitel expressed thanks on behalf of the Richard Jefferies Society and read an appropriate passage from 'The Story of my Heart'. The erection of the viewing table and plaques was a millennium project planned by Liddington Parish Council who also wanted to replace the memorial plaque to Richard Jefferies and Alfred Williams that had been placed on the trig point by JB Jones [Swindon schoolmaster and scholar] some 70 years ago. This plaque disappeared a few years ago and it was assumed that vandals had pulled it down. We were pleasantly surprised to learn today that the old plaque had been found in a field and had been taken to the Bath Road Museum. As this is the first we had heard about the recovery of the plaque and, as we can see no value in placing the plaque at Bath Road Museum, we have asked for it back so that it might have place of honour at the Jefferies Museum. Photo: courtesy Gordon Wilson, Liddington Parish Council. By the side of the brook is a great lime. Its leaves unfold to the sun. On its flowers the bees are lurking. Near the path on the other side of the stream is a row of pine-trees, their delicate tufted plumes of an enchanting green. In the deep wood beyond no bird voices stir the velvet-footed silence. There is no bird music amid the pines and the stems of the trees rise tall and straight towards the sun. The floor of the wood bears a thick carpet of pine needles and there is no undergrowth. In this hush of silence one's very footsteps as we tread softly, seem too loud. Not far away in the beech copse the wood pigeons are busy, their incessant voices seem everywhere. Elms and alders grow near the stream, some graceful branches stretch over the water. A wren has its nest in an alder and a magpie nests in a lofty elm. As one pauses by the stream to listen to the current lapsing by, [how delightful is the sound!] reed-sparrows may be seen in the flags and if you stay long enough and watch quietly you may see a water ouzel. The kingfisher haunts the pool beyond the bend and flies like an arrow in a flash of colour. Now and then hovering above, a heron may be seen in the blue air. The warblers are singing loudly. The cries and whistlings come thick and fast. The ground is covered with fallen blossom, for this is the time of the June rose. Swallows dart here and there, hawking over the water. A jay flies from a tree and utters its discordant note. The rooks over the hedge are busy in the cornfield among the green corn. On the rocks which rise in the middle of the stream where it broadens out, clings saxifrage; campions, wild parsley, and water avens are in a crowd and iris, more clearly seen, as it rises above the other plants. The reeds sway to the lapping of the wavelets. As we watch, half abstracted and half dreaming in the bright June sunlight, small trout rise and a water hen may be seen in the reeds, but is soon out of sight, where the tall grasses rise. Listen! amid the sweet twisted babel of bird voices is one above all, it is the note of the chaffinch, a short song, but sweet and often mellow. The chaffinch is perhaps the most common of all our birds. Its nest, wonderfully and compactly constructed, is a work of art. It is most cleverly hidden and almost impossible to detect, so great is its resemblance to the trunk against which it is placed on the bough. Now the rain begins to fall. Slowly at first, drop after drop, then more swiftly and in greater volume until there is a sharp shower for a few minutes. We shelter under the thick leafy boughs on the margin of the wood, inhaling the varied sweet scents which the rain has stirred up. A hedgehog, intent and self-absorbed, is jogging along the green ride. The clouds pass swiftly, the rain ceases and we go on our way; leaning over a gate near the Home Farm, we pause for a moment to look at the bluebell wood, the myriad blue flowers cover the ground here like a carpet, so thick are they. It is a delectable sight and lingers on in the mind long after it is seen no more. The sunshine has returned and in the golden light the bluebells seem like flames rising from the woodland soil. In the pause after the rain there comes an even louder bird chorus, each bird seems singing its loudest and sweetest, the voices of the thrush and the blackbird rise and fall amid the rush of sound. It is almost like a great hymn of gratitude for the benediction of the light. Let us linger out of doors in the sweet air of June until the light begins to fade from the sky and the stars appear. Every moment in this most delightful of all the months, snatched from the passing of inevitable time, is to be enjoyed and cherished, stored in the memory when darker days return.